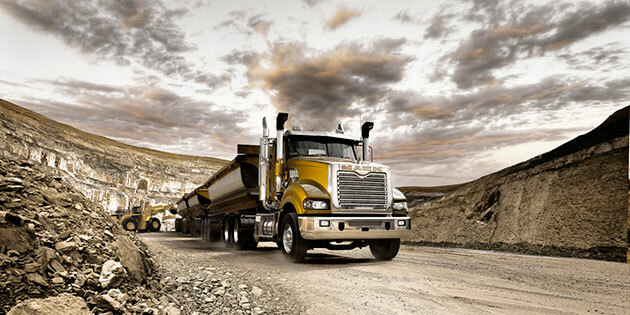 If you're taking good care of your heavy-duty Mack® truck, it's running like the well-oiled machine it was built to be. But it's critical to keep oil in its place on your truck, as excessive oil and moisture in your air system can wreak havoc on your brakes and pose a major safety hazard. Think of your compressor as the heart of your air brake system. It builds compressed air, filling the air tanks so you can count on your brakes to bring your Mack workhorse to a halt any time, any place. Air is heated as it's compressed, and cools as it travels through the discharge line to the air tank. The condensation from this cooling creates pools of water in the bottom of your truck's supply, or “wet” tank. Drain this tank daily to prevent excess moisture from congealing with oil and dirt in your air compressor and causing problems similar to a heart attack in the human body. Oily sludge in your compressor can thicken, clogging valves, and can freeze and cause blockages in your air lines in the cold winter months. Air system leaks can spring from oil-deteriorated seals, costing you points during roadside inspections. Never fear. Your Mack truck is well-equipped with components that remove contaminants and keep your air system running smoothly while you're on the road. Your truck's compressor has a filter at its outlet, and any contaminants the filter doesn't grab are typically caught by a condenser/separator and then an air dryer. Mack's exacting specs require your air dryer to have a coalescing filter that collects oil droplets and a desiccant bed that removes 95 percent of the remaining water vapor from the pressurized air. A duty cycle - or the ratio of time the compressor takes to build air to the total engine running time - of greater than 25%. Excess oil in your truck's wet tank. Your air brake charging system seems slow to build pressure. Talk to your expert Mack technicians to help determine which compressor is best for you, and whether your air dryer fits Mack's standards for optimum quality. Be sure to have your air system professionally inspected during each preventive maintenance visit at your nearest Mack Trucks dealership. You can also order air system components online through SELECT Part Store™, where you'll find monthly discounts on popular parts and shop supplies.